"On their first trip into the Ruin, Tom had said that fear makes you smart, but Benny understood now that his brother had been talking about caution rather than fear. These zoms, every last one of them - even the smallest child - would kill him if they could, but not one of them meant him harm. Meaning, intention, will ..... None of that was part of their makeup. There was no more malice there than in a lightning strike or bacteria on a rusted nail, and as he sat there, he felt his terror of them give way to an awareness of them as something merely dangerous. The intense hatred of the dead he had once harboured was gone completely; burned out of him in Harold Simmons's house. Only the fear had remained, and now that, too, was wavering in it's intensity. Charlie, on the other hand, was something still to be feared. Charlie was far more dangerous than any single zombie on the planet because his malice was deliberate ..... "
I do not like surprises. I hate my birthday, I begged my boyfriend and threatened him until he told me what he bought me for Christmas and spoilers call to me like Sirens luring sailors to a bleak end (reading spoilers is not fatal, but I always feel disappointed with myself afterwards .....) However, Rot and Ruin surprised me and I very much enjoyed it. It's the story of Benny Imura and his older brother Tom. It's a story of growing up and facing truths you thought, in your young, naive mind you could hide from forever. It's about recognising what's right and what's wrong, even if it means taking the right path will mean a harder climb. It's about standing by your morals and your principles, even when all around you others are leaving theirs behind. It's about looking inside yourself and finding that little spark which can make a hero out of all of us. It's about making peace with a world that has turned it's back on you. It's about finding truth and sanctuary in a reality filled with violence, deceit and betrayal. It's about the importance of the ties that bond us to our loved ones, family and friends and never turning your back on the ones you love even when all seems lost. It's about the value of dignity, even in death. And it's about courage, loyalty and strength. 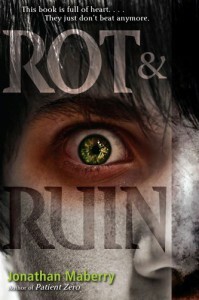 Rot and Ruin is not so much about zombies - it's about the people fighting for a life amongst the zombies. Mountain is a secure town, safe from the horrors that lie beyond the fence where zombies roam the countryside and violent bounty hunters make the laws to suit themselves. Tom Imura's job is to seek out zombiefied loved ones of the residents of the town and quiet them, lay them finally to rest. He takes his younger brother Benny on as his apprentice and when the truth of how this new world operates is revealed to Benny, he and Tom set out to put things right. I gave the book four stars as there were moments where I felt the character development was a little weak and rushed. Some of the supporting characters were a little two dimensional. There were incidents of telling rather than showing, some would say the ultimate sin of fiction. And the epilogue, while completely necessary to tie up the story, was a bit of a drag. However, the action was fantastic, heart-in-your-mouth kind of reading, brilliantly paced and vividly described. The man characters felt genuine and on the whole, likeable (I initially thought Benny was a jumped up, spoilt brat. But, this was of course, the authors intention. 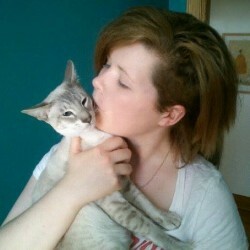 He grew on me fast.) The plot was very well woven, revealed one slice at a time. Loved it! Read it! Enjoy!